Bigger than big. The MCM welcomes a new distance to conquer when the MCM50K is inaugurated on October 27. 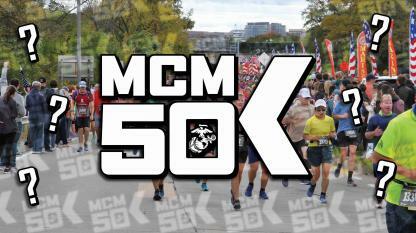 The MCM50K shares a start line with the Marine Corps Marathon in Arlington, VA. Participants will begin the MCM50K prior to the Marathon and run the entire MCM course with the addition of a 4.87-mile diversion at Mile 4.5. Registration opens February 27, 2019 at 12:00 p.m. (noon) eastern time. Registration is now closed. All participants receive a technical quarter zip shirt and finishers are presented with a stunning finisher medal by a U.S. Marine. Registration fee is $200. Consult sizing chart to determine best fit of participant shirt. After registering for the MCM50K, some runners unfortunately are unable to participate. These runners may opt to transfer their entry to a non-registered runner through the Transfer Program. The MCMO doesn't assist in the identification of individuals to receive a transfer. Runners often find transfer partners on the MCM Facebook page. Runners currently registered for the MCM50K may transfer an entry to another runner. There is a $50 transfer fee (plus processing) associated with transferring between individuals. Either individual involved in the transfer may pay this fee, it is the current owners choice. When transferring an entry, runners do not receive a refund on registration fees. Any such monetary transactions must be handled directly between the transferring runners. MCM50K transfer program, between runners, is currently open and remain open through September 15. Select the option to pay the transfer fee or to pass on the transfer fee to the new runner, click 'send.' At this time, the original runner is removed from the event and placed in the transfer file. The new runner will receive an email with a customized link to complete the transfer. 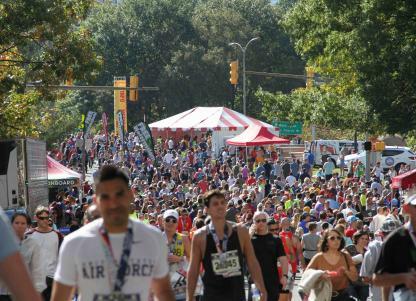 The start of the MCM50K is located on Route 110 in Arlington, VA-the same location as the Marine Corps Marathon. To access the MCM50K start, runners will enter the streening area in Runners Village, located at the Pentagon North Parking lot. After being screened, runners will be directed towards the start line. The USATF-certified MCM50K course will follow the MCM course across the Key Bridge and divert at mile 4.5 for an out-and-back along Canal Road. There, the MCM50K course rejoins the MCM and continues onto the finish at the Marine Corps War Memorial. The course includes 13 waters points and 11aid stations. The MCM50K will start at 7:30 a.m. prior to the MCM that begins at 7:55 a.m. The MCM50K participants can visit Runners Village prior to the event for the info tent, porta johns, UPS Baggage Drop-off and a screening zone for access to the start area. The howitzer will fire at 7:30 a.m. officially sounding the start of the MCM50K. The MCM50K course will remain open until 3:00 p.m. Required Maximum Pace: All MCM50K participants must maintain a 12:30 minute-per-mile pace. Metro is the most convenient means to arrive at the start of the MCM50K. Access to Runners Village is available through the Pentagon station (yellow or blue line). 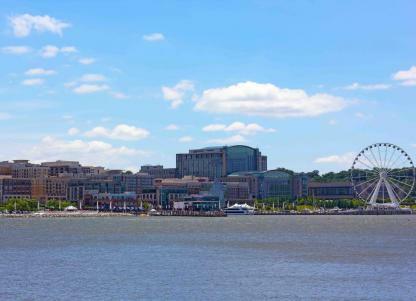 Free shuttle service is also available from Crystal City and the Gaylord National Resort. From Crystal City: Shuttles will follow a route from 23rd Street and Crystal Drive in Crystal City to Runners Village in the Pentagon North Parking lot from 4:30-8 a.m.
From Gaylord National: From 4:30–6:00 a.m., MCM offers runners-only shuttles from the intersection of Waterfront and St. George to Runners Village at the Pentagon from the Gaylord National Resort, the MCM headquarters hotel at National Harbor. Beginning at 6 a.m., shuttle service will deliver runners to the Eisenhower Metro station (yellow line) until 9:00 a.m.
To exit from the finish area in Rosslyn, runners and spectators may use either the Rosslyn station (blue/orange/silver), located in the Finish Festival, or Arlington Cemetery (blue). 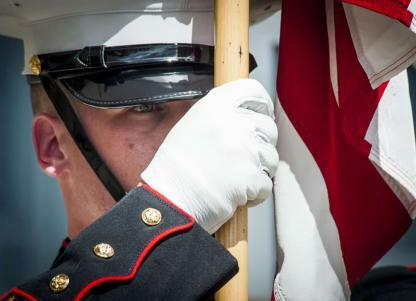 The Arlington Cemetery station will not open until 8:30 a.m. on event morning. Runners must maintain no more than a 12:30 minute-per-mile pace. 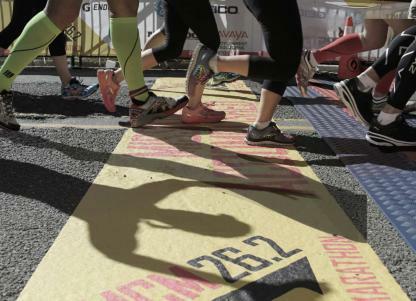 At Mile 22 of the 50K, participants will reach "the Gauntlet" in Washington, D.C. Those who do not make it through the Gauntlet by 12:33 p.m. will be diverted from the certified Marathon course at Independence Avenue to 14th Street and may continue running but will not complete a 26.2 mile course. These individuals will not be recognized as official finishers. “Beat the Bridge” -- All MCM50K participants must reach the intersection of 14 and D Streets before the 14th Street Bridge by 1:15 p.m. at Mile 25. The “Crystal City Gauntlet” must be reached by 1:49 p.m. at Mile 27 or participants will be diverted from the certified course at 12th Street South as it becomes Crystal Drive. If diverted at any of these locations, participants may continue running but will not complete the official course. These individuals will not be recognized as official finishers. WP 1: Eastbound Lee Highway between Wayne and Adams Streets. WP 2: Intersection of M and 33rd Streets, NW, in Georgetown. WP 3/4: Along Rock Creek and Potomac Parkway at grassy median. Water Point #3 is located in northbound lanes; Water Point #4 is located in southbound lanes. WP 5/7: Independence Avenue and Ohio Drive SW at West Potomac Park. WP 6: Ohio Drive SW parking area near the end of Hains Point. WP 8: At Madison Drive NW and 12th Street NW along the National Mall. WP 9: At Jefferson Drive SW and 7th Street SW along the National Mall. WP 10: Near Army-Navy Drive at Eads Street. (Water Point #10 also supports the MCM10K). WP 11:Along Long Bridge Drive in soccer complex parking lot. WP 12: At Lady Bird Johnson parking area on Boundary Channel Drive, in the North Pentagon parking area. Post-MCM: Bottled water from Wegmans and Gatorade will be distributed in the hospitality area. 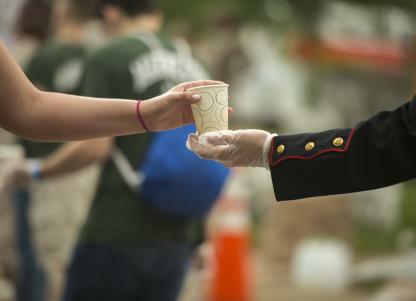 Medical Tents are located near the finish on the Marine Corps War Memorial. Medical Information tent is located at the intersection of Lynn Street and Fairfax Drive. Medical personnel will track runners and record medical data to ensure timely updates are available to families of runners receiving assistance. Runners must use the clear plastic bag provided at Packet Pick-up. UPS baggage trucks will be located in Runners Village. A UPS Baggage Sticker will be available for every MCM50K runner. The sticker, which is attached to the runners bib, features the runner's bib number and the assigned UPS truck to be utilized for baggage drop off and pick up on event day. On event day, runners affix the sticker to a bag to facilitate easy identification. Do not deposit valuable items. Neither the MCM nor UPS is liable for lost items. After the run, MCM50K participants may pick up a bag in the Finish Festival. UPS will be situated at the intersection of Lynn Street and Wilson Boulevard. The MCM50K features a wide variety of musical entertainment throughout the course. From the first mile to the last, runners and spectators are treated to inspiring artists, motivating music and exciting entertainment. The MCM50K shares the finish line with the MCM and MCM10K. Adjacent to the Marine Corps War Memorial, runners will pass under the famed MCM arch to receive a finisher medal from an awaiting Marine Corps lieutenant. After taking a victory photo in front of the Memorial with MarathonFoto, MCM50K finishers receive a hospitality box, Fyffes bananas, bottled water from Wegmans and Gatorade. 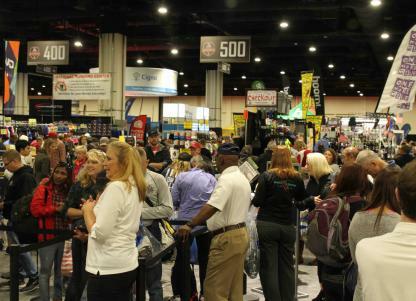 With hundreds of vendor booths, Packet Pick-up, interactive displays, giveaways and more, the Health & Fitness Expo presented by Cigna, is the first stop for runners. Hotels are available at special rates for MCM runners and spectators. Book early for the best deal. Mission Accomplished! MCM finishers celebrate with supporters in downtown Rosslyn amidst music, fun, giveaways and more. There's a new option to #RunWithTheMarines on October 27 with the announcement that the Marine Corps Marathon Organization will be introducing a 50K as part of MCM Weekend. The inaugural MCM50K will take place on Sunday, October 27, the same day as the 44th MCM and the MCM10K.